The extract from the Rules: «The subscription is free. At any time you can cancel the service by using appropriate link placed in every our email. You can subscribe to any number of calendar occasion reminders. We will try to keep you informed of actual information interesting for you. 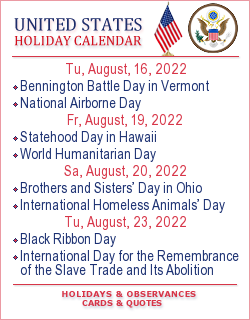 At the moment our Holiday and observances reminder service provides all next week calendar occasions reminder. We can also remind you about only one holiday or several holidays you choose.